Cairo (Agenzia Fides) - A delegation of the Sunni University of al Azhar, led by the Grand Imam Ahmed al Tayyb, also took part together with Egyptian President Abdel Fattah al Sisi at the "official inauguration" of the new Coptic Cathedral and Mosque in the urban area 45 km from Cairo, destined to become the new administrative capital of Egypt. The official inauguration ceremonies, which took place on Sunday 6 January, on the eve of Coptic Christmas, were desired by the Egyptian political leadership as a moment of clear symbolic value to relaunch the image of a country founded on the coexistence among different communities and religious identities, united in common rejection of terrorism and sectarianism that threaten its political and social stability. 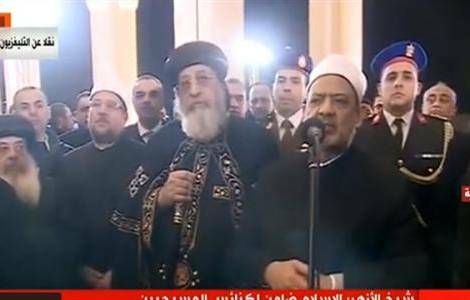 The inauguration of the Great Mosque was also attended by the Palestinian President Mahmud Abbas and Arab League leader Ahmed Aboul Gheit, while Egyptian singer Angham performed songs praising the coexistence between Muslims and Christians.